Alia Bhatt is busy promoting her upcoming film Raazi which will be released in theatres on May 11, 2018. The Badrinath Ki Dulhania actress was snapped at the Mumbai airport on May 7, 2018. 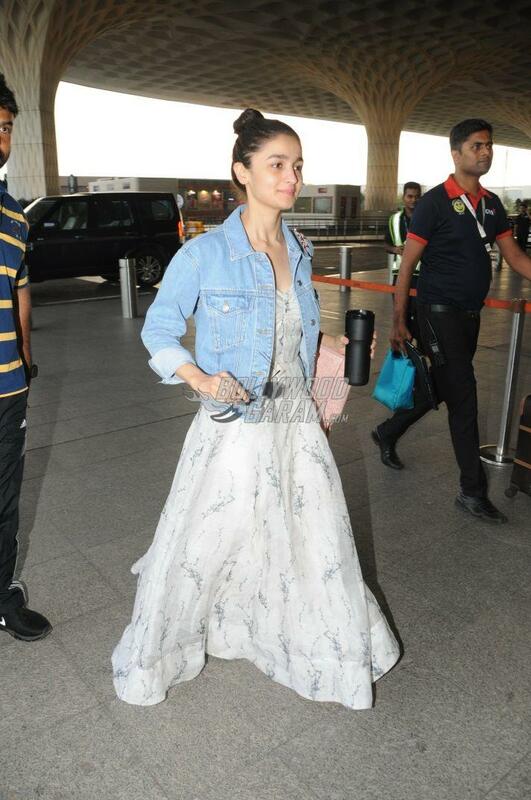 Alia was snapped leaving for Delhi and was at her casual best. Bhatt was seen in a printed white maxi outfit with a denim jacket and her hair tied in a high bun. The actress was all smiles for the paparazzi at the airport. Alia in a recent interview revealed that it was emotionally exhausting for her to shoot for Raazi. Apart from Raazi, the actress has a number of films lined up for 2018 and 2019. Alia recently wrapped the Bulgaria schedule of her upcoming film Brahmastra opposite Ranbir Kapoor. The actress will also be making a special appearance in the film Zero. Alia has also started filming for the multi-starrer flick Kalank. Raazi is directed by Meghna Gulzar and also stars Vicky Kaushal.